NEWS from the vortex. Scope the "ABOUT" section for contact info, reviews, interviews, and links. 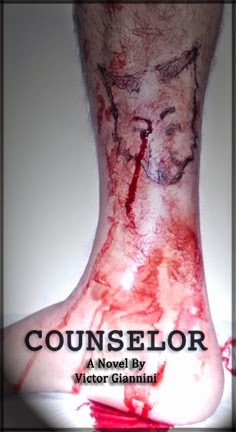 : An Excerpt from "Counselor" courtesy of Silverthought Press! An Excerpt from "Counselor" courtesy of Silverthought Press! Every villain thinks he’s the hero, and Timothy Dune, cursed by an ancient island-god to kill everyone he loves, is about to have a memorable night. Counselor by Victor Giannini will be released by Silverthought in limited hardcover, paperback, and digital editions in early 2015. NOT the COVER ... but yes, it's real.